The United States military is censoring portions of its investigation of the Kunduz hospital bombing in Afghanistan, to "sanitize" it for public consumption, an MSF chief told Radio Sputnik. The US military has an official record of its full investigation of the Kunduz hospital bombing, in Afghanistan, but is censoring parts of it to make it acceptable for public consumption, Jonathan Witthall, Head of the Humanitarian Analysis of Doctors Without Borders (MSF) told Radio Sputnik. The calls for an independent investigation have received no official reaction from the US military or US President Barack Obama. 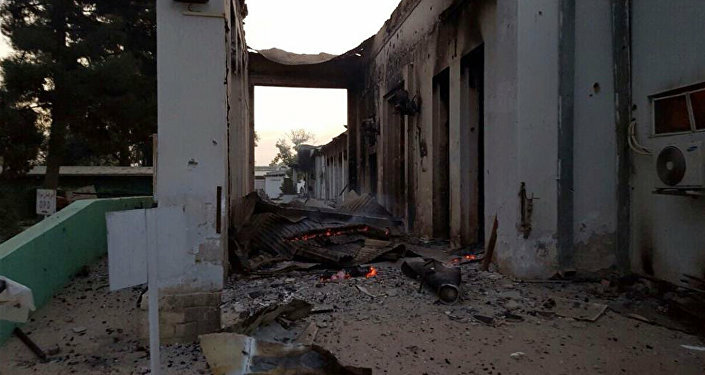 The US Air Force bombed the Kunduz hospital in October, breaking the rules of war regarding hospitals. "The full report and the full findings haven't been made public, and the reason we've been given for that is that it's been going through a redaction process, which means that it's being sanitized for public consumption," Witthall told Radio Sputnik. US military servicemen responsible for bombing the hospital and shooting its patients from an AC-130 have been given minor reprimands or temporarily suspended from duty, while no generals were punished. The US military, like those of other countries, considers it the duty of soldiers and officers to not carry out ilegal orders. The United States military has refused to offer compensation for victims of the Kunduz hospital bombing, and is likely to continue its previous policy of "condolence payments," Jonathan Witthall, Head of the Humanitarian Analysis of Medecins sans Frontieres told Radio Sputnik. "What we've seen is that the US does not offer compensation, what they offer is condolence payments, they offer condolences for the loss of life and livelihood to the families of the deceased," Witthall told Radio Sputnik. The practice of offering condolence payments allows the US military to avoid acknowledging guilt, while making public relation gains at a relatively small cost. It was previously famously used after the US military shot down a civilian Iranian airliner, and then offered payments to relatives of the deceased on condition that they could not be used as evidence of guilt for further claims. "The families of the people killed are not satisfied with the condolence money being offered, it's really not at all matching the severity of the events, the scale of the destruction, the scale of the loss of life and livelihood for many of the families," Witthall added. US General John W. Nicholson, recently appointed as commander of NATO forces in Afghanistan recently offered an apology, which was not widely received by relatives of the victims of the attack.